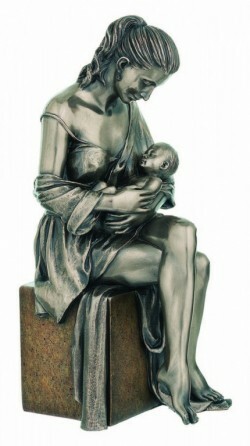 A heart-warming modern sculpture showing a resting mother cradling her newborn, on a plinth. Made from solid cold cast bronze and hand finished to perfection. Fully felted on the bottom to protect surfaces. Part of the Genesis Bronze Childhood range: producing high quality giftware for over 20 years now. Nicely boxed. Includes info card.